Gentedimontagna has teamed up with on Hello Again, a series about the non-traditional hotels in interesting places. Forget everything you’ve ever known about sleeping in a tent. 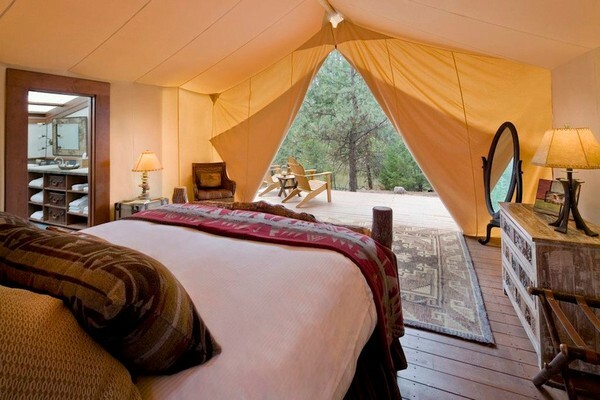 At Paws Up in Montana, glamping happens at a whole other level of awesome. 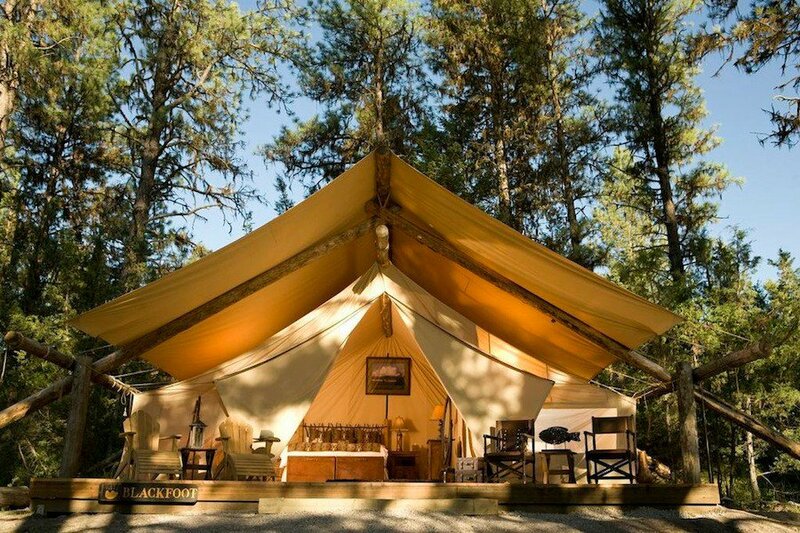 GREENOUGH, Montana – To rugged adventurers, the luxury tents at may seem like an outrage. But one night in their signature "Last Best Bed" will change any wry and weary traveler's tune. 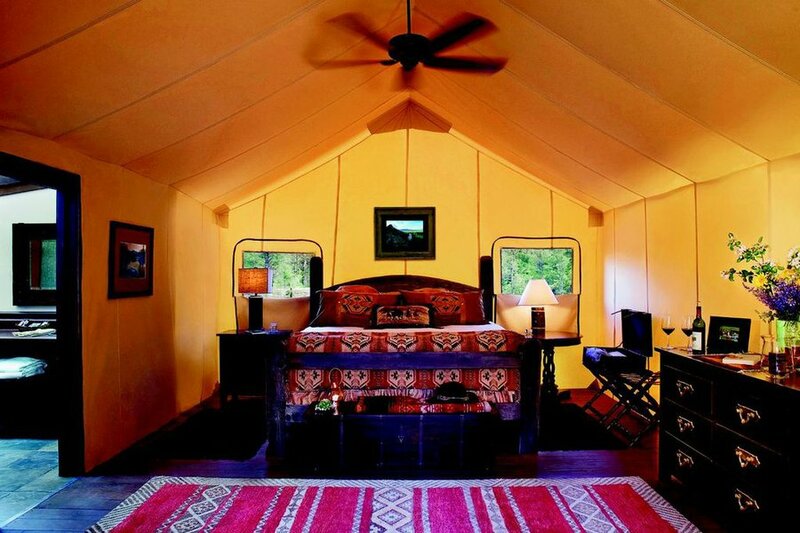 This summer marks the eighth season of glamorous camping at Paws Up. But tent living is not a novelty in this neck of the Montana woods. 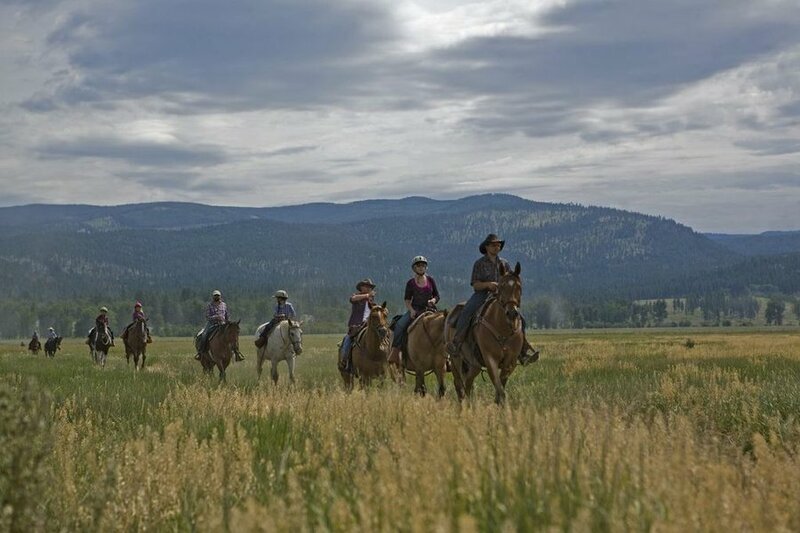 Long before it was a destination for the leisure class, Blackfoot Valley was home to the Nez Perce, Flathead, and Blackfeet Native American tribes and later frequented by fur trappers, miners, and loggers. In 1806, on the way home from the Pacific, Captain Merriwether Lewis tramped along the riverbanks with Second Lt. William Clark, purportedly pausing where the Blackfoot and Clearwater Rivers meet to scale a craggy mass now known as Lookout Rock, in hopes of catching a glimpse of the Marias River. Two hundred years after Lewis and Clark's journey, the resort opened on the surrounding 37,000-acres in Greenough, 30 miles east of Missoula. 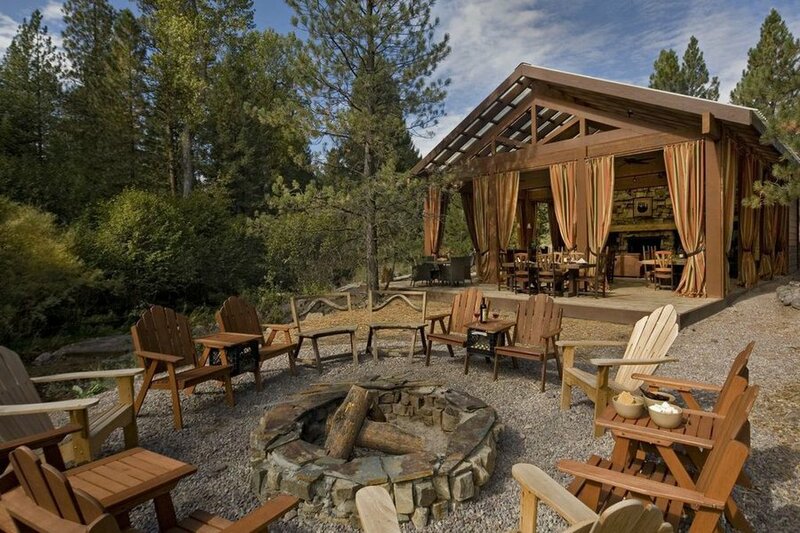 As soon as signs of the icy harsh winter have melted away, canvas exteriors and a massive collection of American Western furnishings are hauled out of storage and reassembled at five campsites, where 30 permanent tent frames weather the elements. 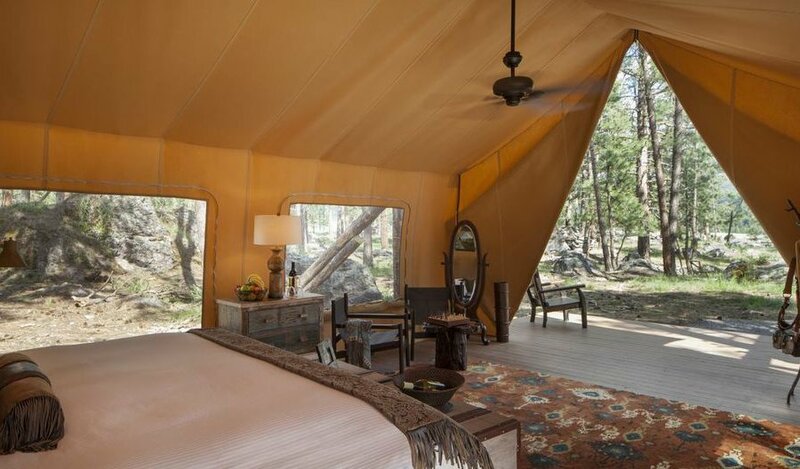 While all of the spacious one — and two-bedroom tents are outfitted with electricity, their signature beds, fine linens, rustic trunks, chairs, and tables, each is individually decorated with Americana artwork and handicrafts, like bedside lamps decked with bows and arrow-stitched cowhide lampshades. Some dwellings have en-suite bathrooms, and, depending on the camp, heated slate floors. Other tents have facilities just a few steps from the deck. Twice-daily housekeeping and a camping butler keep things tidier and more organized than an escape into the wild would normally allow. Inside the furnished, cozy tent. With the tent flaps drawn shut, it’s hard to discern one camp from another. But throw the canvas flaps open, and the location makes all the difference. Moonlight Camp is set off the Blackfoot River at the foot of Lewis and Clark’s famed Lookout Rock. Creekside Camp is situated on the banks of Elk Creek, where campers can find a place by the stone fireplace to warm up on a cool night. The decks of the tents at River Camp open onto Blackfoot, where fly fisherman are often spotted wading through, trying their luck. Pinnacle Camp overlooks the confluence of the Blackfoot and Elk. The premiere camp, and site of Tango Point, is a honeymoon suite complete with a two-person claw-footed tub and climate-controlling cooling fans and heaters. This will be outdone by the tents at Cliffside Camp, situated on a bluff offering panoramic views of the river, which debut this summer. It will be the first camp with air conditioning. Immersed in nature with all of the amenities, the only rough thing about Paws Up is having to check out. 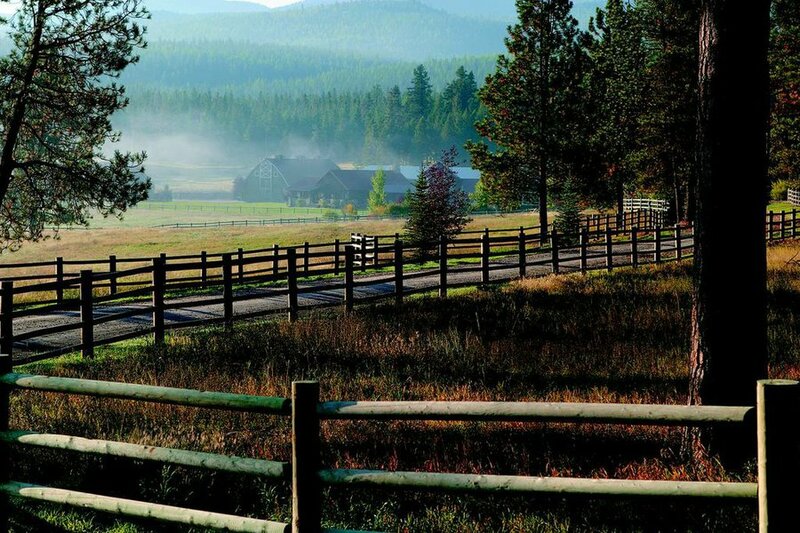 The setting of on 37,000-acres in Greenough, Montana. The campsite, completed with a stone fireplace to warm up on a cold night. A view from inside the spacious, furnished tent.